MoSoClub is a club management platform designed for small and mid-sized gyms and fitness clubs with single or multiple locations. The platform offers a connected suite of tools with 28 modules and front desk check-in features with integrated billing, and a point of sale (POS) system for payment processing. Users can generate over 150 standard reports, and drill down into data using the custom report builder. MoSoClub provides users with a 360-degree view of each member’s account information, from financial information to demographics, on a single screen. Users can upload various documents without file size restrictions to store contracts and other important agreements. MoSoClub’s modern front desk check-in with works card readers, key-tags, and RFID scan, and allows staff to redeem PT (personal training) packages and track members’ purchases. Users can monitor which classes members are attending through the platform’s scheduler which is tied to myClub, a member-facing scheduling component. myClub allows prospects to sign-up online, and enables members to make payments, book PT sessions or group fitness classes, as well as update their account information online or via mobile device. MoSoClub also allows members to automatically sync class calendars to their personal Google calendar. The MoSoClub platform is accessible from any web browser, enabling club managers or owners to monitor employee punch-ins from anywhere. The integrated billing system allows users to bill clients and report on any number of criteria, such as charges and payments, to accounts receivable. In addition to a vast number of standardized reports, the custom report builder allows users to create custom fields to monitor specific member actions or track visit patterns. I have been working with Motionsoft for a number of years and on a number of hospital based, medically integrated projects. As a consultant in the medical fitness industry I rely heavily on the software and technology capabilities of my software partner. Hospital IT teams can be very picky and therefore my software partner needs to be flexible and agile. The Motionsoft system has always been reliable and when it's not customer service is always happy to help. We had specific needs to use Motionsoft's API to connect to another software system and it all went without a hitch. 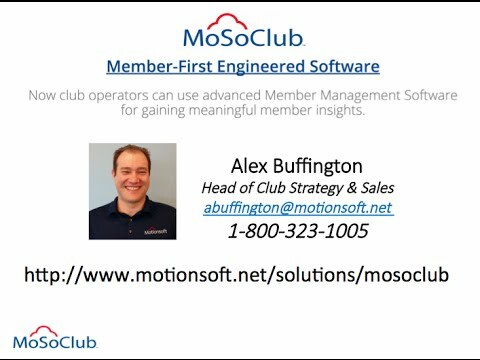 Obviously, billing and member management are critical to any club operating system and Motionsoft met all of my needs. Finally, when I was in need of an online scheduling system Motionsoft was able to provide a system that was flexible, fast and accurate.The flexibility of the platform and the customer service associated with using the product. To clarify, this is for MoSo club. Which i was lead to believe is the same as Motionsoft, but their other product for mid-sized health clubs. In short, their IT team tried (and continues to try) its best to help us (with very industry staple requests) but in the end fails to have the resources, or the ability to help. This caused us to lose a healthy chunk of our EFT transactions in our conversion over to MoSo even though the process took over a year and required our attention and help along the way. This set our clubs growth back about a year. Otherwise, we now have to audit the EFT deposits often to make sure MoSo club (or their full-service team) continues to function as intended. So to find out if this software is for you, ask very detailed questions and make sure you verify the features your business requires so you know the function exists. Do not assume any simple function or feature would be there as you might be unpleasantly surprised. Member Check-in Screen, Boss (automated Account receivable reach out) System. Member Check-in Screen, Boss (automated Account receivable reach out) System. I'll try to keep this brief but will likely fail. Software looks like it has more reporting than any other system in the industry, however the most basic of reports ranging from service provider (PT/group ex) payroll to assessing incoming bill-ables, or account receivables out right don't exist. They make you select from 10+ filters every time you want to run a report (without the ability to save your favorites) and most the time it's not the report you wanted (even with their help). Simply put, the sales and management team will yes you to death to sign you up and then attempt to build everything along the way and unfortunately fail in the process. Also, full service billing (their team posts all transactions for you daily or otherwise) often times "forgets" to process your billing for your clubs. So I hope you have a way to audit to catch money missing. 1.5 years into working with them they are still "creating" our group exercise scheduler. So its almost 2019 and we have a PDF on our website to show people our schedule... And of course, it's the most expensive software to top it off. Contact Motionsoft for detailed pricing information. MoSoClub allows gyms and fitness clubs to offer members 24/7 virtual access through myClub and the online scheduler. Users who need to manage multiple locations are able to see a snapshot of all club activity on a single screen, without having to logout and login again to view another location. MoSoClub's front desk check-in works with various entry systems from key-tags, card readers and RFID, enabling users to activate turnstiles or magnetically lock doors. Automating routine, time-consuming front desk, and back office functions, allowing staff to focus on providing member services and creating great member experiences. Gaining member insights from the biggest collection of reports in the industry to make smart, actionable decisions and drill down into data for meaningful member insights. Below are some frequently asked questions for MoSoClub. Q. What type of pricing plans does MoSoClub offer? Q. Who are the typical users of MoSoClub? Q. What languages does MoSoClub support? Q. Does MoSoClub support mobile devices? Q. Does MoSoClub offer an API? Yes, MoSoClub has an API available for use. Q. What other apps does MoSoClub integrate with? Q. What level of support does MoSoClub offer?